This happens to be my favorite picture of Dennis Rodman. 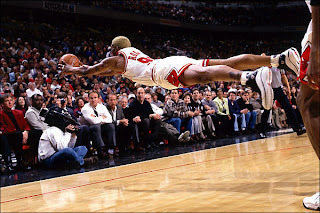 In fact this is the picture that should be used to define Dennis Rodman the basketball player. This picture is from the 1996-1997 season. From what I could find out it was a home game against the Pacers. I only remember seeing the picture, but I feel pretty comfortable in saying that Rodman got that ball and that Bulls won the game. This was the first season that Rodman wore Converse. This is before his first Converse signature shoe was released, which I am sure will make on the Friday Flashback someday. However today's Friday Flashback will focus on Rodman's shoes in the picture above. 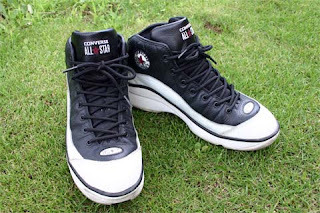 The Converse All Star Springfield was released soon after the famous All Star 2000 that saw the return of the Chuck Taylor patch to modern basketball shoes. This shoe also featured React Juice for cushioning. I wish I had more pictures of these shoes, but the truth is I haven't been able to get my hands on a pair of these. A retro version of sorts has been released in China, I believe. It has the same upper with the exception of the logo which is replaced by the Chevron and Star. If I can find a picture I will post it later. If you had these shoes please share your experience in the comments section below. I tried to not be too predictable here and go with the Weapons or the Run n' Slams. So I am going to try and keep it interesting. Thanks for reading my blog and come back throughout the week and again on Friday for more Friday Flashbacks. That would have to be my favorite Converse sneakers. Used to have exactly the same colorway (would love to have them again, but there's no way to find them anywhere). I used to have the first Tar Max and Run-n-Slams. and I started wearing other shoes. something from my old closet. basketball court. My Gosh. I have never felt so easy & light in my life ! Тhese are probabably the best basketball shoes I ever wore! Now I'm looking all over to find a pair, but at least on the Internet, can't seem to manage! I like the springfields very much as well, but never wore them. Can You help me find any of these shoes on the net ? A retro release is fine also ! Please reply! I'm dying to get some compassion from Ol' Converse fans.